OpenText™ "Luke Skywalker – Content Jedi or Joker?" - Open Text Web Solutions Usergroup e.V. OpenText™ "Luke Skywalker – Content Jedi or Joker?" Mark Hamill is a good guy. I’ve been lucky enough to meet him on a couple of occasions in the past, and was looking forward to his closing keynote at the recent Content Marketing World conference in Cleveland. 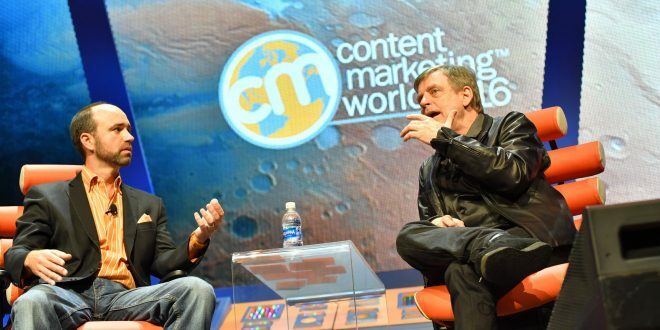 But the keynote address from the man best known for playing the hero of the Star Wars movies never materialized, instead Mark sat down for a Q&A session with Content Marketing Institute founder Joe Pulizzi that proved to be both highly entertaining and thought provoking. Hamill endeared himself to the audience straight away by referencing a blog post from content marketer Michael Brenner, which despite its provocative title sets out a coherent thesis on the connections between the hero’s journey that informs the Star Wars mythos and storytelling in marketing. And it was to storytelling that Hammill returned to several times during his conversation by reinforcing that the most effective form of communication, the one that we are all hardwired to understand, is storytelling.